It is common to develop muscle imbalances around the hip. Hip stretches are part of a treatment plan to address these. In people that sit at work for long periods of time hip flexors and rotators can become tight, and gluteal muscles become weak. This can affect gait, posture, spinal stability, and movement patterns. 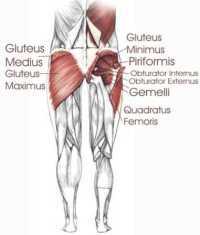 What are the Major Muscles of the Hip? Why do We do Hip Stretches? Because the line of muscle action varies relative to the axis of rotation of the joint some muscles will have more than one action depending on the position of the hip. Positioning of the hip affects pelvic and spinal posture and function so the regular performance of hip stretches will help you maintain a good posture and alignment. The piriformis originates over the anterolateral surface of the sacrum where it lies close the the sacral nerves S2-S4. It then inserts into the greater trochanter along with the other powerful external hip rotators. The syndrome consists of the symptoms that result from mechanical impingement or irritation of the sciatic nerve as it emerges from the pelvis. This can be pain, tingling, burning, or numbness that worsens with movement of the hip into adduction, internal rotation, and flexion. Physical therapy is used to treat piriformis syndrome through freeing up the nerve, increasing mobility, relaxing muscle tone, and increasing the resting length of the piriformis muscle. Hip stretches are one part of a treatment plan. If you experience some of these symptoms you should consult a physical therapist to rule out other sources of radiating leg pain. 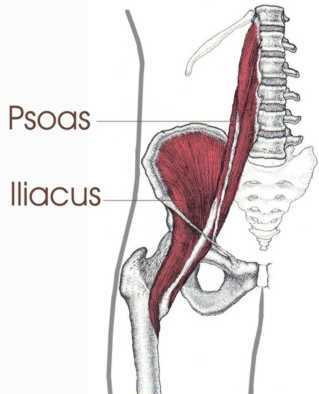 The hip flexors are the psoas major, psoas minor, and iliacus muscles, all of which insert into the lesser trochanter on the femur. Keep your chest up and don't bend forward at the hips. To stretch the left side in sitting cross your left leg over the right so that your left ankle is laying across your right thigh. Put your left hand on your left thigh and gently press down until you feel resistance. Then tilt forward at the hips slowly as you exhale. Remember to keep your chest up and your back straight. Don't allow yourself to hunch forward or lose the normal lordosis (inward curvature) in your lower back. Hold this position for the appropriate time. For most individuals 30 seconds is beneficial. Again, to stretch the left side, begin as above with your left ankle laying across your right thigh. Grab hold of the left knee with both hands and pull your left knee up toward your right shoulder. Pull to the point of resistance but not pain as you exhale slowly. Sit on the floor with your left knee bent in front of you and your right knee out to the side with right foot behind you. Bring your left foot around such that it touches the right knee. Put your hands on the floor in front of you with your arms straight. Inhale and lift your chest up. Breath out as you lower your shoulders over your front knee until you feel a gentle stretch. Inhale as you raise your chest while maintaining a good curvature in your lower back. Lower yourself again forward and repeat this until you can lower yourself to the floor. Rest your head on your hands and relax your breathing to allow the stretch to go further. When you are exhaling slowly look around toward the back leg and move your hands toward that direction. This hip stretch addresses multiple muscles and planes. Tightness around the hip joint and hip muscles is very common among athletes and will restrict full movement and optimum performance. This is a stretch for the hip rotators on the left side while lying down. Cross your left leg over the right so that your left ankle is across your right knee. Keep your head and chest flat on the floor while performing this hip rotator stretch. Tighten your abdominal muscles and push your lower back down against the floor and lift your right foot up off the floor. As you are lifting your right foot, hold onto your left ankle with your right hand and gently push your left knee down away from you. Hold this position for the appropriate period of time, relax, and breath. You need a certain amount of trunk control and abdominal strength to do this exercise. If you find it too difficult because of weakness or lower back discomfort then try the hip rotator stretch in sitting. People with arthritis in their hips will have a lot of difficulty with this stretch. If you experience pain down the front of your thigh or groin pain then seek the advice of a physical therapist. You may have a hip joint dysfunction or other problem that may worsen if not treated appropriately. 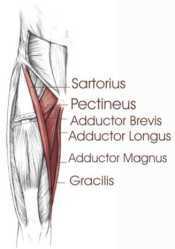 The adductors are those muscles situated on the inside of your thighs. Some cross both the hip joint and the knee joint, and some cross only the hip joint. We will refer to those muscles that cross both the hip and the knee joint as the long adductors and those that cross only the hip joint as the short adductors. Kneel onto your left knee and put your right foot in front of you such that your right knee is at 90 degrees. Inhale and slide your left knee out to the side and back. Exhale and left your chest up. Kneel onto your right leg and place your left foot in front of you to assume the lunge position. Slide your left foot out to the side and place both hands on the floor in front of you. Try to straighten the left knee and lean your body forward while relaxing your hips. Rocking the hips forward and back will change the pull slightly to get all muscles. Long adductors can also be stretched in sitting. 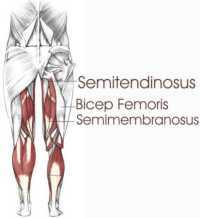 This hip stretch also includes hamstrings biasing the medial hamstrings, semimembranosus and semitendinosus. To stretch both sides simultaneously sit with your legs straight out in front of you with your back straight. Slowly work your legs apart as far as they will go. Hold this and relax for a few seconds. Now as you exhale bend forward at your hips until you feel more resistance. Hold this for the appropriate time. Most people will gain a benefit from 30 seconds. The powerful hip extensors, the hamstrings and gluteus maximus can be stretched as follows. Most of us rarely need to stretch the gluteus maximus as this muscle is often kept in a lengthened position all day as we sit; however, as we sit the hamstrings are kept in a shortened position so often the hamstrings will become tight. Here are a couple of easier hamstring stretches. For more detailed hamstring stretching see the following page on Hamstring Stretches. The standing hamstring stretch is valid as an effective method of increasing hamstring flexibility, but depends on pelvic positioning. If you are able to maintain a straight lower back while performing this stretch it is significantly more effective. To perform this stretch stand and face a chair or table. Keep your chest up and back straight. Bend forward at the hips until you feel a stretch in the back of your thigh. Most people will benefit from a 30 second hold. The hamstring stretch through the doorway has also been validated in the literature, and is easier in terms of maintaining a stable pelvis. This stretch is performed by lying on the floor with one leg on the wall and the other flat on the floor through the doorway. Pull yourself closer to the wall as you feel a stretch. Most people benefit from this stretch being held 30 seconds. This hamstring stretching method has been shown to be just as effective as the standing hamstring stretch. To stretch the left iliotibial band stand with your left side facing a wall or chair. Put your left foot behind your right foot and point the toes of your left foot out about 45 degrees. Put your right hand on your right hip and while keeping your left leg straight, push your hip in toward the wall. A common mistake made when performing this stretch is to bend forward at the hips or to rotate the body. Make sure you remain upright and keep your torso perpendicular to the wall. For more detailed hip stretches for the iliotibial band see my page on the iliotibial-band.